c.1960. 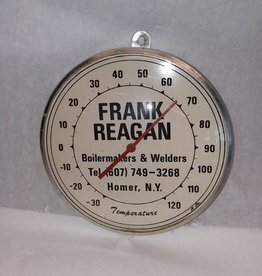 A round advertising thermometer for Frank Reagan Boilermakers & Welders, Homer NY. Reads temperatures from -30 to +120 degrees. This item is 6" across with 2 brackets to mount to wall etc. Made of lightweight tin with a glass convex front.